Going to a different country is one of those things that everyone gets hugely excited about but is actually a bit of a ball ache. It's the promise of the unknown, of freedom - perhaps, even, of sunburn. I certainly suffer from tan-vanity, desperate to catch any whiff of sun so I look marginally cooked for a few weeks. But travelling is just such a pain, with the documents and the foreign currency; the extortionately priced sun-cream and stupidly small bottles of variously purposed liquids; airports in general… We all love a holiday – and then we get there and almost immediately look forward to returning to the rain and routine of the Bonny Island. 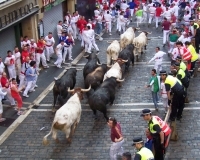 For one week in early July the small Spanish town of Pamplona is transformed into a traveller's paradise. Locals, Europeans, and a sh*t ton of rowdy Australians gather together for a week of Sangria drinking, food fighting, and adrenaline seeking on the cobbled streets of what is normally a very quaint little town. 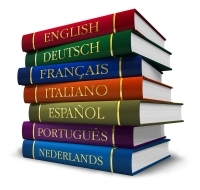 Learning a Language: What's The Point? I hated learning French at school. Learning languages seemed like an unrelenting circus of panic revision for vocabulary tests, and dense, nonsensical grammar rules. Hell, basically. And, unless they spoke another language at home, everyone else seemed to find it equally taxing. Spanish was slightly better, but I still felt embarrassed when I had to speak up in class, and was so bored by learning about how to order in restaurants, or say the words ‘post office’ and ‘ham sandwich’. It didn’t feel relevant to my life. And so I put the whole foreign languages thing on ice. I mean, what’s the point? All my friends and family speak English. It’s the language of business, right? Plus, other countries are so good at learning English, it would be pointless to try and beat them at their own game. The Whitsunday Islands are a must see if you’re planning a trip around the east coast of Australia. If you're travelling alone, I encourage you to see the islands in style, on board the Clipper, the ultimate party experience. As you board the boat among a sea of fellow travellers bearing plastic cups of budget beverages, you can foresee the next three days as a time to remember, or at least try to. Paris: Romantic or Just Plain Cheesy? One of the burdens of pretension my very average degree has given me is the need to try and be original. Before doing anything, I ask myself whether I’ve seen it done before. You’ll understand then, that when my girlfriend asked me if I wanted to go to Paris, I was hesitant: “It’s such a cliché!” I bellowed, originally. What followed was a nuanced debate: she told me to get over myself. We went. With lovely golden, sandy beaches and a crystal clear, sparkling sapphire sea, we have an image that could be taken from a multitude of sun-kissed holiday destinations across the world, and dropped onto the front of a picturesque postcard. Yet this isn’t Majorca or Tenerife; traditional tourist excursions. Instead, we have the stunning and splendid, lesser-known island of Skiathos, in Greece. It is a place that offers scenic and vibrant views, endless relaxation, and in essence, a holiday that you will never forget. They're Tacky and Embarrassing, So Why Do We Love Awards Shows?